THE BAY SEASON 2 MIXER is fun filled and exciting for “The Bay.” It includes Stand-up Comedy, Live Entertainment and an amazing cast of television icons will be the scene of THE BAY The Series’ Season 2 Mixer scheduled to take place at 8:00 pm PT on Wednesday, April 25th at Busby’s East located at 5364 Wilshire Blvd., in Los Angeles, CA. Tickets are $20 per person ($10 for active members). 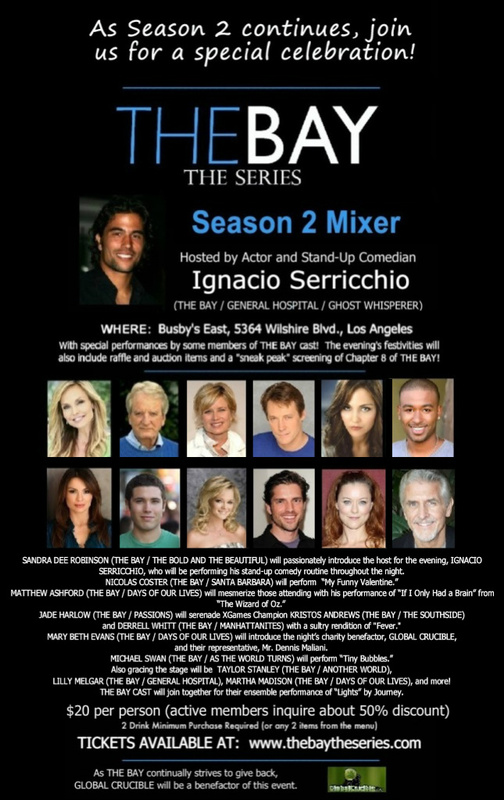 This star-filled mixer will be hosted by Ignacio Serricchio (THE BAY / GENERAL HOSPITAL / GHOST WHISPERER), and will include a sneak-peak at Chapter 8 of THE BAY! Purchase tickets for the Season 2 Mixer Event HERE. ABC SOAPS IN DEPTH: Mingle With THE BAY Cast! CBS SOAPS IN DEPTH: Mingle With THE BAY Cast!